It's a mystery no more. 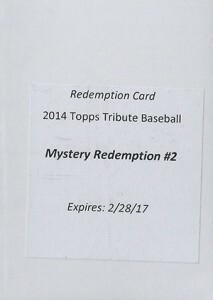 The two 2014 Topps Tribute Baseball Autograph Mystery Redemptions have been revealed. The first is an exclusive Hank Aaron card. The autograph commemorates the 40th anniversary of the slugger passing Babe Ruth to become baseball's all-time home run leader. 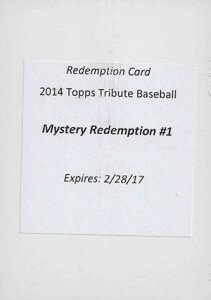 White Sox rookie, Jose Abreu, is the set's second redemption. Besides basic versions of the cards, both autographs have Gold parallels. This ends speculation on who would appear on the cards. Abreu's name had been tossed around since 2014 Topps Tribute Baseball first released. Many collectors were wondering if Masahiro Tanaka would be the second, however Topps has yet to announce an autograph deal with the Yankees pitcher. David Barstow � I believe it is because the version #/25 is the base and there is also a Gold (#/15) and Red (#/5) parallel. 2014 Topps Tribute Factory Sealed Baseball Hobby Box Mike Trout AUTO ?